Mark Thaler brings nearly 30 years of focused experience in the preservation, renovation, and adaptive reuse of historic structures. 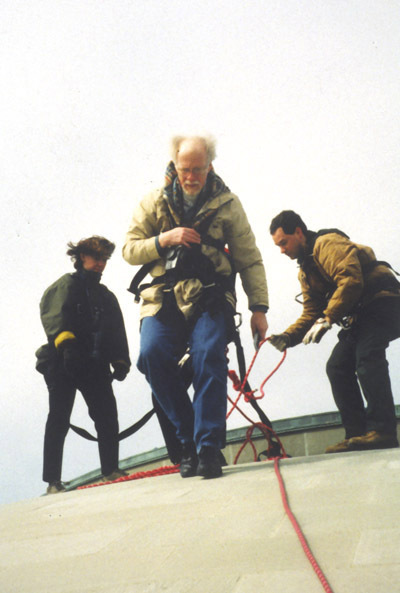 He is an expert in contextual design, existing conditions analysis, and integrating modern building systems and energy conservation measures into historic buildings. His clients have included Princeton, Harvard, University of Virginia, and the University of Wisconsin. Author(s): Mark Thaler - Einhorn Yaffee Prescott, Architecture & Engineering P.C. In the broadest sense, to renovate something is to make it new again. This chapter explores some of the unique issues associated with renovating existing buildings and provides links for further inquiry. The issues associated with renovating an existing building can be complex. Many factors should be considered when an institution is faced with such a decision. 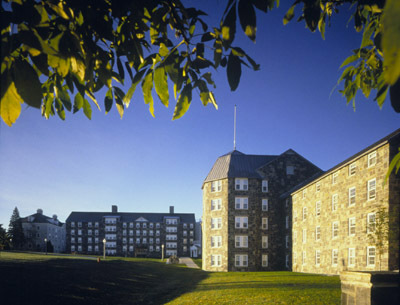 Some of these factors include the condition of the existing building, the type of construction, whether the building can be altered to meet the proposed programmatic requirements, building code and zoning considerations, accessibility, sustainability, budget, location, swing space, whether the building has unique historic attributes, and the importance of the building to the history and traditions of the institution, to name a few. Repair is the reconstruction or renewal of any part of an existing building for the purpose of its maintenance. Alteration is any construction or renovation to an existing structure other than repair or addition. Restoration is the process of accurately reconstructing or repairing the forms and details of a building or structure or portion thereof as it appeared at a particular period or periods of time by means of removal of later work and/or the replacement of missing original work. Preservation is the act or process of applying measures necessary to sustain the existing form, integrity, and materials of a historic property. Rehabilitation is the act or process of making possible a compatible use for a property through repair, alterations, and additions while preserving those portions or features that convey its historical, cultural, or architectural values. These definitions are important because they have specific requirements in the building code and may influence the scope and design philosophy of the renovation project. The standards of the Secretary of the Interior have been adopted as a requirement in many local historic districts around the country and could influence how a renovation is carried out. There are many factors to weigh before deciding whether to renovate a building or to demolish it and construct a new building. First, the building must be evaluated objectively, and all challenges and opportunities must be considered. Selecting an architect or engineer with experience in renovating older buildings that are similar to the building under consideration is a good first step in the process. The building's history and subjective value are important to consider. For example, deciding to renovate a building that is well loved by alumni and an icon of the campus certainly does not require nearly as much institutional soul-searching as deciding to demolish a building that is disliked by students and no longer meets programmatic requirements. However, there are many reasons that an institution may decide to renovate, such as budget or lack of swing space while a new building is being constructed (it should be noted that lack of swing space while a building is under heavy renovation may tip the scale in favor of new construction if an alternative site is feasible). According to a formula produced for the Advisory Council on Historic Preservation, about 80 billion Btus of energy are embodied in a typical 50,000-square-foot commercial building. That’s the equivalent of 640,000 gallons of gasoline. If you tear the building down, all of that embodied energy is wasted. What’s more, demolishing that same 50,000-square-foot building would create nearly 4,000 tons of waste. That’s enough debris to fill 26 railroad boxcars—a train nearly a quarter of a mile long, headed for a landfill that is already almost full. Once the old building is gone, putting up a new one in its place takes more energy, of course, and it also uses more natural resources and releases new pollutants and greenhouse gases into our environment. It is estimated that constructing a 50,000-square-foot commercial building releases about the same amount of carbon into the atmosphere as driving a car 2.8 million miles. One more point: You might think that all the energy used in demolishing an older building and replacing it is offset by the increased energy efficiency of the new building, but that’s simply not true. Recent research indicates that even if 40 percent of the materials are recycled, it takes approximately 65 years for a green, energy-efficient new office building to recover the energy lost in demolishing an existing building. And let’s face it: Most new buildings aren’t designed to last anywhere near 65 years. A good example of renovation over new construction is provided by Middlebury College. 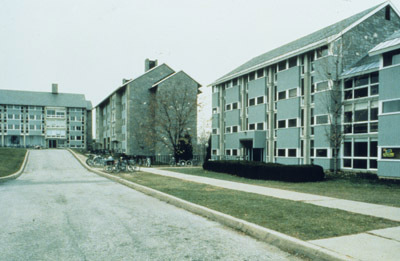 Several buildings on the campus had been constructed as residence halls in the 1970s, were not aesthetically in harmony with the other buildings on the campus, and did not function well. At first, architects for the college thought the buildings should be replaced, but after carefully evaluating the buildings and understanding how they could be modified, the architects designed a renovation that addressed the programmatic deficiencies and included recladding the buildings in stone to harmonize them with the rest of the campus. The result was a project that was much less expensive than replacement, environmentally sustainable, and provided the type of facility that met the college’s needs. Another good example is the Franklin Environmental Center at Hillcrest at Middlebury College. Figure 1 and Figure 2. The buildings above were re-clad with stone when they were renovated to harmonize with the architectural style of the campus. Photos: EYP Architecture & Engineering. A thorough evaluation of the building is necessary to establish what issues may need to be addressed during renovation. This evaluation is best done by a design professional who has experience with buildings of similar construction and building type. Small projects may be able to be evaluated by experienced facilities staff personnel or an architect. For larger projects the evaluation is often performed by a team of design professionals. The team, usually led by an architect, may include structural, civil, mechanical, electrical, plumbing, fire protection, and environmental engineers, as well as specialists in historic preservation, acoustics, audiovisual systems, cost estimating, and landscape architecture, as well as other specialists who might be required for specific occupancy types. Ideally, the team members should have experience working with one another. Facilities staff should work with the evaluation team to plan the scope and timing of the evaluation. They should also provide the team information on previous work that may have occurred in the building and provide access to drawings, specifications, work orders, and archival data that may be pertinent. Meetings with maintenance personnel and selected building users may also provide valuable insights into building issues that may be addressed by the renovation. Depending on the type of building being evaluated, the facilities staff may also need to arrange for access to rooms with individual residents or academic departments within the institution. Allowing the evaluation team sufficient time onsite to conduct a thorough analysis of the building is crucial. Often overlooked, archival research can be extraordinarily helpful to complete as a first step in the evaluation. College or university archives may contain the building's original drawings and specifications, construction photos, correspondence between the original architect and the administration, and even plans for future expansions. This information can give the evaluation team clues as to why certain problems of repair are occurring, how the building can best be modified, what missing features might be restored, or where hidden chases are located that can be used as new mechanical or electrical pathways. Other possible locations to find archival data can be local libraries or historical societies, local building departments, or other repositories to which the original architect may have donated his own holdings. One excellent resource that can be consulted is Columbia University’s Avery Architectural & Fine Arts Library, which has drawings from a number of famous architects. or other repositories and can be an invaluable resource when planning a renovation. Photo: EYP Architecture & Engineering. The next step in the evaluation process is to conduct an existing conditions survey. If current drawings are available, the entire team may arrive to conduct their survey and use the drawings as a basis for making field notes and identifying problems of repair. If there are no drawings, or the drawings are not sufficiently accurate, the architect may prepare a set of measured drawings before additional survey work is completed. These drawings would likely include floor plan and floor-to-floor height information at a minimum but might also include elevation, section, and detail information. Developing accurate base drawings is a worthwhile early investment, as they can be used to document field conditions and later can serve as the basis for construction documents. The existing conditions survey should identify and document the condition of existing finishes, structural systems, and other building systems. An environmental survey to identify hazardous materials that may require abatement may be included as part of the existing conditions survey, or it may be conducted independently. In either instance, it is important that an environmental study be completed early in the process to identify any environmental hazards. The survey should include a thorough evaluation of the building’s exterior envelope, including the roof, windows, and wall construction, for signs of moisture penetration, remaining longevity, and the need for maintenance and repair. Thermographic imaging can be used to help locate areas of moisture in roofs and masonry that may otherwise remain undetected by a simple visual survey of the structure. Such imaging can also show areas where insulation is missing or compromised, allowing energy loss and possibly condensation to occur within wall cavities. Figure 4 and Figure 5. Physical investigation combined with thermographic imaging was needed to discover where moisture infiltration was occurring at the dome of The Massachusetts Institute of Technology. An evaluation of life safety systems, accessibility, wear of interior finishes, and signs of deterioration such as rot in wood and rising damp in masonry should all be addressed in the survey. The structural engineer should identify and investigate any signs of structural instability. These may manifest themselves in a variety of ways, including cracked or dislocated finishes, plaster cracking, sagging floors, or doors and windows that no longer operate freely. Exterior signs may include cracked masonry or corroding steel. Steel-framed buildings can rust where moisture infiltration has occurred. The corroding steel can swell as it rusts, causing adjacent masonry damage. If the cause of structural movement is not readily determined through visual inspection and a review of existing documentation, it may be necessary to use additional destructive or nondestructive methods to evaluate the extent of structural damage. As part of the existing conditions survey, the structural engineer may investigate the potential loading capacity of the structure. Required floor-loading capacities and seismic requirements have changed over time, and although the building may have served the same use for many years, building codes may require structural upgrading during a renovation, especially if there is a change of use to a more demanding occupancy. Electrical systems should be evaluated to determine whether electrical service equipment, lighting fixtures, and wiring are able to be reused or whether they will require replacement during the renovation. The capacity of the building’s electrical service will also need to be evaluated if the new program will include equipment that might have high electrical loads, such as an elevator. Heating, ventilating, and air-conditioning systems should be evaluated for functioning and efficiency. This may include testing of equipment and piping. Ductwork can build up pockets of dust and debris over time, and if moisture is present, this may sustain mold growth. These issues can be identified through air testing and video recording within the suspected ducts. 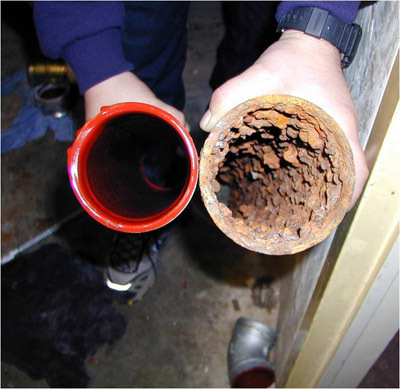 Piping can corrode over time on the interior of the pipe. 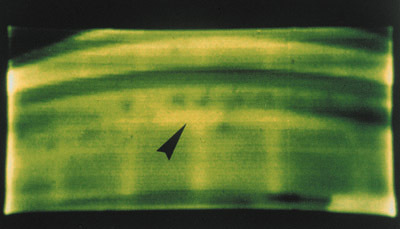 This condition can be checked by cutting out sections of pipe for review. This is also true of plumbing piping, which can clog over time through both corrosion and sediment buildup. Figure 6. When corroded pipes like that seen on the right cannot be easily replaced, they can sometimes be reconditioned in situ through sandblasting and re-lining with epoxy. The reconditioned pipe at left has a projected life-span of 70 years. Sprinkler piping can also corrode over time. Dry pipe sprinkler systems that are tested annually are more prone to pipe corrosion than wet systems because of the cyclical wetting and drying of the piping. Another issue that should be evaluated during the existing conditions survey is whether the existing sprinkler head layout has been compromised by previous renovations or modifications of partitions, causing some areas to be unprotected. The evaluation team should meet with the institution’s information technology (IT) staff to identify what types of systems are envisioned for the project and what upgrades may be forthcoming on the campus. It is important to plan for adequate IT spaces within the renovated building to allow adequate access and flexibility for wires to be pulled within required distance limitations. If the renovation project includes new programmatic elements or a new use for the building, it is important to understand how the building can best be adapted to meet the changes desired. It is rare that an existing building will perfectly suit a new or modified use without some alterations. For example, partitions or circulation routes may need to be reconfigured, bathrooms may need to be expanded or added, modifications may be needed to improve accessibility, or new stairways may need to be created. Each alteration will have a direct impact on the project budget. This sets up a balance that must be achieved between the desire for an ideal program configuration and the need to minimize cost by retaining the existing building layout. It is important to understand which modifications can be made easily and which are more difficult. If an existing conditions survey has already been prepared, this will be extremely helpful for the architect to assess the building's strengths and weaknesses and evaluate how the building might accommodate the proposed program. If a complete survey is not available, the architect may still be able to prepare a limited feasibility study or conceptual plans, based on information about existing conditions provided by the institution, to determine whether a building could be renovated to accommodate a proposed program. Estimated costs can be developed for each option. Basic engineering systems should also be considered at this time. Existing buildings may have unique or historic features or spaces that are not necessary programmatically but may offer an opportunity to make the building more than it might be otherwise. Instead of using these spaces strictly to meet assignable space needs, the institution may gain more by allowing the space to remain unassigned or to assign a new use that would not have been included initially. When renovating a building, it is necessary for the architect to have a thorough understanding of applicable building codes. Usually, routine maintenance and repairs will not trigger building code upgrades. However, alterations of an existing building or a change of use will almost always require some code-related upgrades. The scope and magnitude of the required upgrades may be mitigated, however, through the use of variances when appropriate. A number of states have enacted "rehabilitation codes" that do not treat renovations as stringently as new construction. The reasoning behind these codes is to allow buildings that have served well for decades to remain in use and continually be upgraded as each subsequent renovation takes place. Often, only renovated areas of the building are required to be brought up to current standards. Many state building codes also recognize the importance of maintaining the cultural heritage embodied in our historic buildings and provide specific exemptions from some code requirements. Sometimes this requires the building to be certified as historic by the state historic preservation office or by a local authority having jurisdiction. The National Conference of State Historic Preservation Officers provides a directory of state offices. Changes of use often require buildings to be brought up to standards of new construction, although some state building codes base those requirements on whether the new use is of greater, equal, or lesser hazard. Zoning ordinances can also affect the scope of a renovation project and may prohibit certain changes of use. For example, zoning might prohibit changing the use of an existing building located in a neighborhood adjacent to campus from an administration building to a fraternity. Zoning ordinances and local preservation guidelines may also prohibit certain physical changes to existing buildings. It is therefore important to know the requirements ahead of time, and if strict adherence is burdensome, to engage the authorities with well-reasoned and persuasive arguments. An institution that has a good rapport with its municipality may be more likely to obtain variances than one that has developed an adversarial relationship. To develop an accurate budget, it is necessary to have good documentation of existing conditions and to define a thorough scope of work for the renovation. Some conditions may remain unknown before work begins, despite completion of a survey of existing conditions. For example, rot in roof sheathing might go undetected until the roof is removed. Investigative probes can be undertaken to minimize unknown conditions, but surprises usually cannot be eliminated. When certain items in the scope of work are likely to be encountered but the exact limits are indeterminate before construction, the institution can consider defining a certain amount of repair in the contract documents and negotiate a unit cost to add or subtract area once construction is under way. Another approach is to include a specific dollar amount allowance in the construction contract to be used specifically for that item when approved by the institution and the architect. In either case, it is important for the institution to budget for changes during construction, especially in renovation projects. Often, a construction manager is included on the design team to provide budget information early in the process. In the best circumstances, the architect and construction manager create a true partnership. The construction manager can assist with the existing conditions survey, for example, by conducting investigative probes and establishing a dialogue about costs before the institution commits to a design that may be out of budget. Even with a construction manager, the budget should include a contingency amount at each stage of the design process, including schematic design, design development, and construction documents. The amount may be 20 percent of cost at the schematic design stage; as the construction documents progress, the percentage is reduced. Sometimes the institution may require the architect to prepare cost estimates for the project. More often than not, the architect will engage an independent cost estimator to provide this service. On larger projects, or where the budget is extremely tight, both a construction manager and an independent cost estimator may prepare estimates independently of one another. After each has completed an estimate, the two estimates go through a reconciliation process whereby the budget numbers are discussed and major discrepancies are worked out before the design process continues. Creating mock-up rooms is another method for developing an accurate budget. Mock-ups allow the institution to view what the design will look like while there is still an opportunity to make changes. 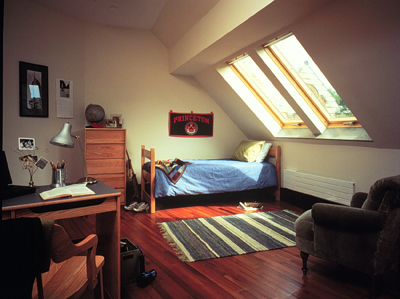 Princeton University has used this method to great effect in the design of its renovated residence halls. 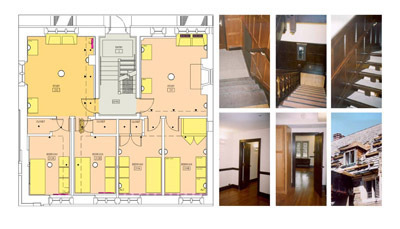 In the design of the renovation of Blair Hall, for example, two side-by-side suites were mocked-up with different finishes, fixtures, and methods for routing building systems. When the mock-ups were completed, the contract manager was able to provide the university with cost data for each design, and these data were then extrapolated for the entire building. Facilities staff also used the mock-ups to get input from end users. Design choices were thereby based on solid information. 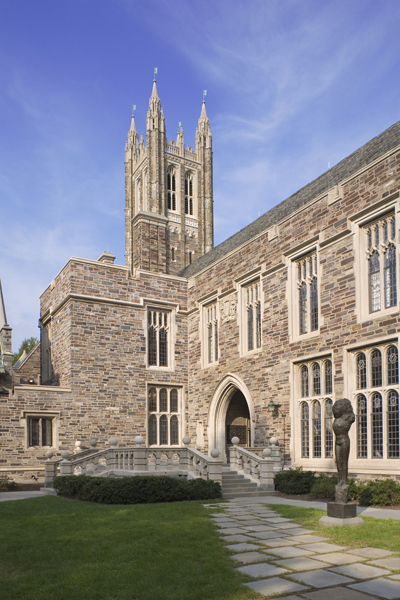 used in the renovation of Blair Hall at Princeton University. Buildings of different construction types have different problems that may need to be addressed during a renovation project. Many older buildings were constructed with masonry bearing walls, generally of brick or stone. These buildings may also have masonry units of concrete block or terra cotta held in a matrix of mortar and may or may not be reinforced with steel. Buildings with cavity wall construction, prevalent since the mid-20th century, will generally have a bearing wall of concrete block on the interior face, with a single wythe veneer of brick or stone, attached with metal ties and separated from the block by an air space that may or may not be insulated. Common problems encountered with such buildings include damage from moisture infiltration at open mortar joints and poor flashings, cracked or exploded masonry faces from the use of repointing mortar that was harder and less vapor permeable than the masonry, disintegration of masonry from rising damp or continued moisture penetration, and cracking in the masonry from embedded steel that is rusting. 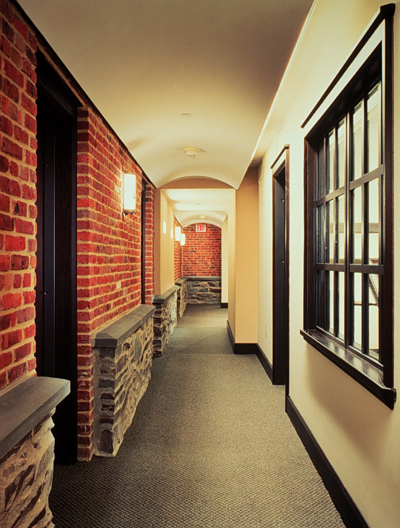 Terra cotta was often used in partition walls in late 19th- and early 20th-century construction. Channeling of these partitions for conduits or piping may require that the affected hollow cores be grouted solid to maintain the stability of the wall. 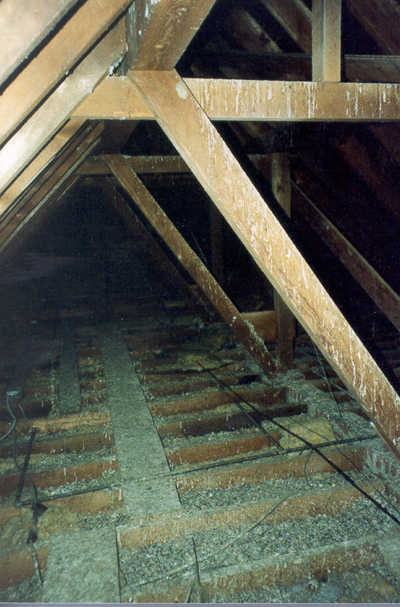 Wood frame construction is susceptible to rot and insect damage. The ends of floor joists that frame into masonry wall construction are especially vulnerable to rot, as are areas around plumbing fixtures or piping that may sweat. Since wood framing is easily removed or altered, one problem that is often encountered is framing that has been compromised from the installation of piping or large conduits. Wood members can also be split by impact loading. Steel-framed buildings may exhibit corrosion of elements that are in contact with moisture. This is especially common where steel columns are located behind masonry in the exterior wall construction. Concrete-framed buildings can exhibit deterioration of the concrete surfaces and corrosion of the steel reinforcing. Additionally, early 20th-century concrete is not necessarily as sound as modern concrete. 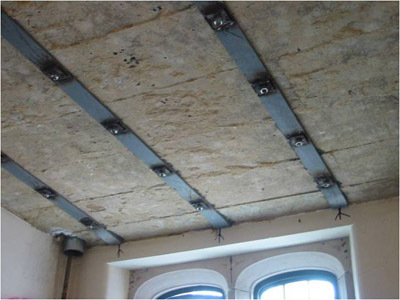 Investigation of the concrete floors during the renovation of Hamilton Hall at Princeton University indicated that the existing floors could not support the required floor loads and had to be reinforced in situ with steel strapping anchored with epoxy both above and below the slabs. to the top and bottom of the slab during the renovation of Hamilton Hall at Princeton University. The renovation of historic buildings requires specialized design expertise by architects or engineers who are familiar both with the technical issues of historic preservation and with the methodology for rehabilitating such structures. The Secretary of the Interior's Standards for the Treatment of Historic Properties provides guidelines for renovating historic buildings, which are useful whether or not required by any authority having jurisdiction. Rather than an existing conditions survey or feasibility study, a historic structure report is often the guiding document for the renovation of a historic building. This report incorporates the existing conditions information with a description of the building's history and its character-defining features that are unique and make the building historically significant. Recommendations are then made as to how the historic building can be best rehabilitated to maintain those historic attributes while at the same time meeting the demands of the 21st century. Historic architects should be familiar with preservation guidelines and historic building code requirements, have a working knowledge of materials conservation techniques, and be aware of specialized conservators, craftsmen, contractors, and products. They will often be able to prepare nominations for inclusion of a building in the National Register of Historic Places, making it eligible for certain building code requirements to be waived and for grants to be made available. Most important, a historic architect should be able to design sensitive interventions that respect the original architecture while providing solutions that meet the programmatic needs of the future. When renovating existing buildings, institutions of higher learning need to be especially cognizant of the requirements to make facilities accessible. It is necessary to comply with the Americans with Disabilities Act (ADA), as well as distinct requirements that are set forth in state building codes and potentially other authorities having jurisdiction. It would usually be required to meet whichever regulation is stricter. The Americans with Disabilities Act Accessibility Guidelines (ADAAG) are utilized in conjunction with the ADA. These guidelines are not identical to the American National Standards Institute's A117.1 standards that form the basis for many state building code regulations. Both sets of criteria should be consulted. The federal ADA legislation can be viewed at http://www.ada.gov/publicat.htm. The ADA website also provides links to planning information and assistance. As places of public accommodation, colleges and universities are covered under Title III of the regulations. While renovating an existing building, it is likely that the building elements being altered will need to be brought into compliance unless it is technically infeasible to do so, in which case it may be necessary to provide an alternative means of accommodation. If the building is determined to be historic based on its inclusion in the National Register of Historic Places or another authority having jurisdiction, certain requirements might be able to be waived if compliance would adversely affect the historic significance of the property. Even in historic buildings it is generally necessary to provide an accessible route to the building, an accessible entrance, and accessible toilet facilities at a bare minimum. Integrating accessibility into existing buildings is not always a simple task. If the modification is a temporary solution to accommodate an immediate need, it will likely affect how seamlessly the design can be incorporated into the existing architecture. If a building will likely be kept to serve the institution for years to come, a more permanent approach is generally more desirable. Often, this work is accomplished as part of a larger renovation project and accessibility modifications can serve other programmatic needs simultaneously. 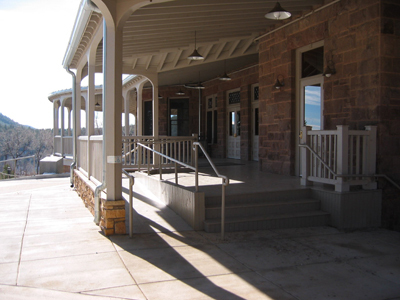 At the United World College of the American West in Montezuma, New Mexico, which adaptively reused an old hotel for use as a new campus center, the restoration of a long-missing porch allowed for the integration of a new accessible ramp. Figure 9 and Figure 10. 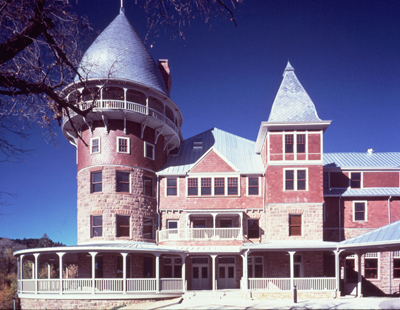 Restoring a missing porch and veranda during the renovation of Montezuma Castle at the United World College of the American West allowed for integration of a handicapped accessible ramp. During the renovation of Madison Hall at Princeton University, a former freight elevator shaft was enlarged and extended to allow for a new accessible passenger elevator as well as a new fire stair. Both of these solutions enhanced the building permanently without creating a “tacked-on” solution that detracted from the original architecture. Figure 11 and Figure 12. Enlarging and extending an existing freight elevator shaft allowed for a new accessible passenger elevator and fire stair to serve a second floor classroom and theater during the renovation of Madison Hall at Princeton University. Sometimes an existing building does not have enough square footage available to meet its programmatic needs. A few of the reasons buildings can become overcrowded and overutilized are the natural growth of departments, an increased need for student beds, or even because the building is in a prime campus location. If the program needs to remain in the building, it is possible to add an addition that can relieve overcrowded conditions, but this is not always possible or desirable. Opportunities of finding more space within the building itself may be an option. Unused or underutilized basements can sometimes be converted into useful programmatic space. Excavation of the basement to provide additional headroom may be a cost-effective approach to adding more square footage if the existing footings are deep enough. If they are not deep enough they could require underpinning, which is a costly but sometimes worthwhile endeavor. Probes to determine the depth of footings and consultation with a qualified structural engineer are necessary to determine whether such a scenario is viable. Figure 13 and Figure 14. 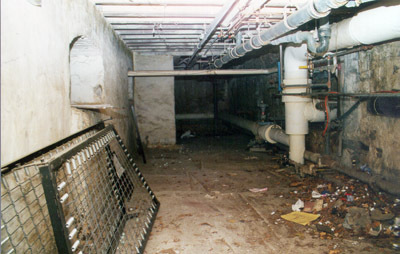 The basement floor was lowered 18 inches and new residence rooms and lounge spaces were created in what were once under-utilized mechanical areas during the renovation of Blair Hall at Princeton University. If previously unoccupied basement areas are to be utilized for occupied space, then special care should be taken to ensure the space will remain dry and well ventilated. Excavation and waterproofing of the basement walls may be required, as well as installation of footing and under-slab drainage systems. It should also be known whether there is a potential for radon infiltration, which may also need to be intercepted and evacuated using an under-slab system. If the proper waterproofing and damp-proofing of the walls and slab are not carried out before a basement is finished for use as occupied space, the owner runs a significant risk of mold growth behind wall finishes and early deterioration of floor finishes—costly problems to rectify. Unfinished attics can also provide the potential for new square footage to be added within a building’s existing footprint. This may require reframing the roof and adding dormers or roof windows, but the space gained can be significant. during the renovation of Blair Hall at Princeton University. Renovation of a building requires a team of skilled designers and contractors who understand how the building is constructed and how modifications can be made most effectively. Unknown conditions should be minimized through extensive evaluations and investigative probes of existing conditions. Working with this team, the institution can achieve a design that meets program, budget, and sustainability needs and will make the campus community proud. Friedman, Donald. Historical Building Construction—Design, Materials & Construction. New York: W. W. Norton & Company, 1995. (New edition to be released in 2010). Friedman, Donald, and Nathaniel Oppenheimer. The Design of Renovations. New York: Norton Professional Books, 1997. Moe, Richard, "Sustainable Stewardship of the Built Environment." March 27, 2009. Berkeley, California. Slaton, Deborah. 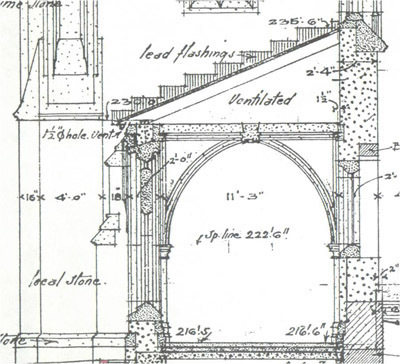 Preservation Brief 43: The Preparation and Use of Historic Structure Reports. Washington, D.C.: Technical Preservation Services, National Park Service, U.S. Department of the Interior, 2005.